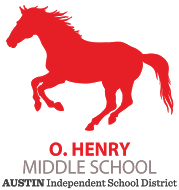 Click on the mustang below to access library catalog. Search O. Henry's online catalog following the link above (advanced search) or type keywords into search box to locate books in the library. Don't see the book you need? Ask Ms. Cross about the possibility of borrowing it from another campus or adding it to the library collection.